Bearing a striking resemblance to Hiphop music icon Tu Face Idiabia has its perks as well as its pressures. Just ask Jo-El. The Oya Now and Hold On singer hit the Nigerian music industry scene in 2014 and has been making waves ever since. SAMUEL ABULUDE recently caught up with the Kennis Music singer, who was born Joel Amadi, at the Best Of Nollywood Awards. 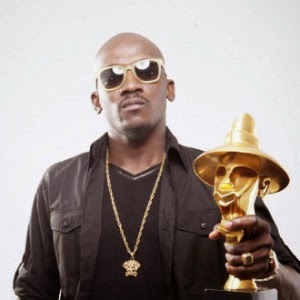 In this interview, the artiste speaks on his music, controversies and close resemblance to Tuface. Would you say 2014 was a good year for you? Yeah! It was a good year. I can’t complain. I have been able to announce myself in the music industry with my songs. I performed at shows like this one (Best Of Nollywood (BON) Awards). You dropped Ileke in October 2014, how is it faring? It has been doing great and not only that; my other singles are doing well and getting rave reviews. Ileke is a club banger; a lovely track produced by my Solshine. Ilekemeans beads in Yoruba. The song is about the beads on women’s waist. It is a delight to behold when ladies dance and shake their waist, gyrating; the colourful beads shake too. Why did you decide to record Ileke? Ileke is a song by my producer. It was a lovely done track by Solshine. I was inspired to do a dance song because my fans have been asking for such from me since I had been releasing songs that were more of R&B, like You’re In Love, I No Mindand She Like Me. They wanted a danceable beat and I spoke to my producer and the idea of Ileke came and the rest is history. So Ileke shows how versatile I am. Paul Gambit shot the video. In terms of awards, how did 2014 go for you? I got the Best Collabo Award at BEN TV UK Awards in London. I was nominated for two HEADIES-Best Collabo and Best Music Video-which was won by Wizzy Pro featuring others in Emergency. The Best Video was won by Clarence for Ada Ada. Oya Now featuring Oritsefemi was produced by OJB. Unlimited LA directed the video. That shows that Oya Now could have as well won both awards. Being nominated is a credit to my relevance that year among other singers who have been there before me. That among other things made 2014 unique for me. My brand is taking shape and the name Jo-EL is being heard on the lips of many, courtesy of my work out there. I can only thank God and hope that 2015 will be better for me. As a somewhat new artiste how do you handle criticism? Criticism is part of the game. You learn to cope with it as a young artiste and keep working on yourself, improving on all aspects of your music. Some people via social media and also in real life come to tell you that what you are doing is not good enough. You have to keep on doing your best and don’t allow negative criticism to pull you down. I have also observed that anyone that abuses you is not your fan. I’m human and can make mistakes. So, I respond by working harder and studying the industry’s terrain because it is tough as a young artiste to get reckoned with and get invitations to perform. That is why I feel honoured to have been invited to perform at the BON 2014 awards. Which of the music genres between R&B and Hip-hop is your forte? I would say I prefer R&B; but you have to be versatile in this industry because of the market. You should be able to hold forth and do other genres of music that suit you. Don’t be a bandwagon kind of artiste. I’d advise every artiste to do Rhythm and Blues song before doing other genres as it makes you versatile and better as an artiste. For example, Iyanya recorded R&B before he did his Kukere hit song and it made him accepted and a better artiste. He has learnt how to churn out songs, especially commercial hits that have made him richer. As a singer, you can’t usually tell what would work for you. We do commercial songs because of the market. Would you say you are now successful as an artiste? I can’t complain (smiles). I can afford three square meals in a day and buy some things that I want. As you are aware, I was the singer who opened the show at BON Awards. I also performed last year at Felabration, campus shows and other mega shows. Watch out for me in 2015! Has your striking resemblance to Tu-Face Idibia been a blessing or otherwise? Well, I can’t say (smiles). Initially, every step I took, people would compare me to Tuface. Some said I wanted to be like Tuface. If I don’t do it like he did it effortlessly, people would complain; but I got used to it. It has been a blessing. People say that not only do I look like TuBaba, but that I sing like him too. Did you deliberately go bald like Tuface? I have always shaved my hair like this before I got to know about Tuface. It is coincidental. God himself did not make a mistake. We just happen to have striking similarities. So, how did you overcome the pressure? I don’t know how. But Tuface himself encouraged me. He gave me a word of wisdom. He said, “don’t allow what people say to get to you negatively. People will naturally want to say something to hurt you but know yourself and ignore the noise and focus. Don’t give up on your dreams.” Those short words from an icon encouraged me. How did recording Hold On with Tuface come about? I must thank Now Music and Hypertek Label for that. I had prayed to do something with Tuface; a collabo that would work for both of us and in 2014 that opportunity came. Hold On is not just a song for me or for Tuface; it’s a song for us as citizens and for every professional to believe in his ability and in our nation. That is what the song is all about. Hold on because the promise will come and will soon be a reality despite the challenges. Would you say Kennis Music has helped your career? Of course! They have been my support. With Kennis, I was able to grow as an artiste. The label makes you look beyond music and plan for the future. What is your take on the music industry and how long have you been in it? I have been in the industry for four years; precisely since August 2010. The industry is good and will get better. With more endorsements coming, I too will get mine. Jo-El is that simple and loving guy who likes to play. I love music am I’m passionate about it. I’m the only son and second child of my parents. I was born in Sokoto and grew up in Kano.